Suddenly, mysteriously, and anywhere at any time, a Ford truck parked on an incline would roll away on its own. At first, the consequences were minor — a dented bumper, a dinged garage door. But one day, at a secluded cabin in rural central Pennsylvania, a Ford F-150 pickup rolled menacingly toward a crawling baby. its rear tire caught his tiny arm, pinning him in place, then rolled over his head. A year later, and with many accidents in between, a spontaneously moving F-Series truck claimed as its victim a three-year-old boy playing outside his home in mountainous Elko, Nevada. Throughout this time, the Ford Motor Company rejected the notion of a hazardous defect in the parking brake of the world's best-selling motor vehicle. It denied responsibility. 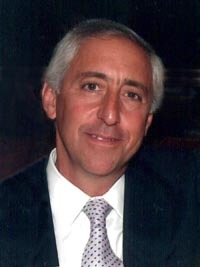 But when some of the victims' families grew suspicious and hired attorneys to investigate, the truth was revealed. 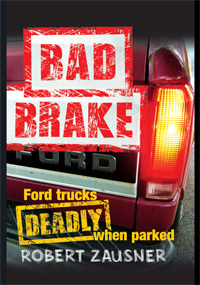 Ford's brakes were bad, dangerously bad. But proving it in court was another matter. Several lawyers went after Ford, wrestling for years with discovery and depositions, trials and appeals. Nearly 15 years were spent trying to obtain justice for one family in a single case. And even after that monumental case was concluded, years later a Ford parking brake, a new-generation brake, would claim yet another victim. It happened after a Pittsburgh husband and father of two left home on an autumn day for his job operating a Ford tow truck. He would never return. 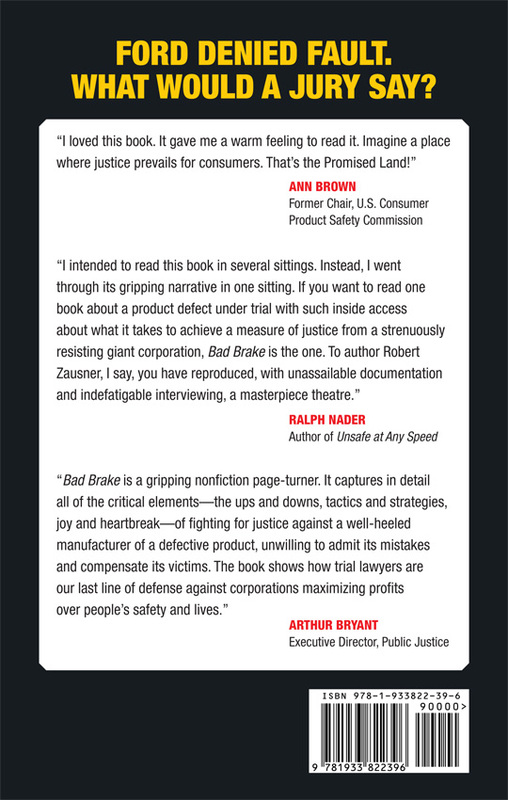 In Bad Brake: Ford Trucks — Deadly When Parked, Robert Zausner tells the true story of three horrific incidents caused by one of America's automotive icons and the legal dramas that followed. In the process issuing a stark warning of the risk that still exists to anyone downhill of hundreds of thousands of Ford F-Series trucks.